Numerous companies have rushed to jump aboard the cryptocurrency and blockchain bandwagon as interest in the technologies continues to increase. Kodak Eastman Co. is the latest company to venture into this new, retail territory with the announcement of KodakCoin: a cryptocurrency intended for the needs of photographers. KodakCoin cryptocurrency will be launched along with the KodakOne Platform and will create an “encrypted, digital ledger of rights ownership for photographers”, allowing artists to license new and old work on the platform. Kodak hopes the coin will curb the use of unlicensed images and allow artists to receive the payment they deserve for their work. Other projects, such as Stream Token, have attempted to address the shortcomings artists and entertainers face economically, but KodakCoin is the first blockchain project designed specifically for photographers. Jeff Clarke, CEO of Kodak, hopes to solve the problem using the decentralized nature of blockchain. Kodak also plans to mine Bitcoins this year and has partnered with company Spotlite, a licensee of Kodak, in order to do so. The companies have already ordered mining rigs, with more expected to arrive in the coming weeks. The plan utilizes Kodak’s on-site power generating plant, which has not been used to its full potential since Kodak’s prime. The rigs will use as much power as if a hairdryer were left on twenty-four hours a day, costing the company about four cents per kilowatt per hour. Bitcoin may very well be a bubble, but the blockchain trade is just not a bubble. Although it is still uncertain whether KodakCoin will actually solve this problem, investors were sent into a frenzy following the announcement, causing the company’s stock prices surge. The company faced bankruptcy just years ago as a result of the digital age but has found its footing thanks to the same reason. Kodak’s stocks soared to as high as 130% above opening price today, before closing at around 119% above opening price. If the idea is a success it presents exciting possibilities for other creative fields, such as music. Initial coin offerings begin on January 31st to investors in the U.S., U.K., Canada, along with selected other countries. Do you think KodakCoin will be a success? Will it be useful in helping artists earn their rightful inc0me? Let us know in the comments below! 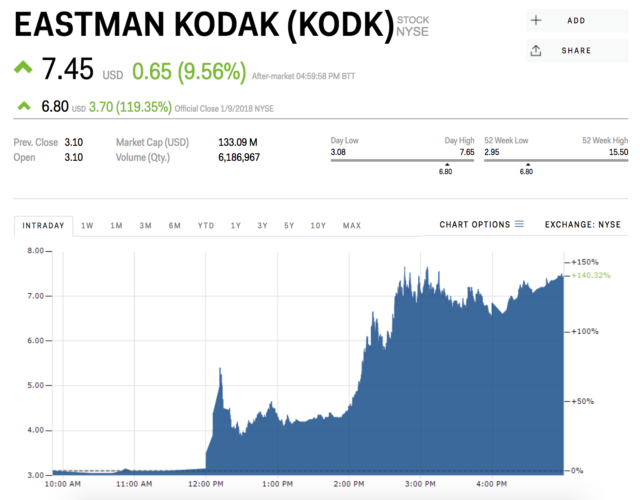 The post Kodak Stock Jumps 60% After Announcing Plans to Launch Own Cryptocurrency, KodakCoin appeared first on Bitcoinist.com. New Perfect BITCOIN Segwit2X: Who Is Afraid And Why?